This month’s Essentials by Ellen Mix It Up Challenge is with Impression Obsession. 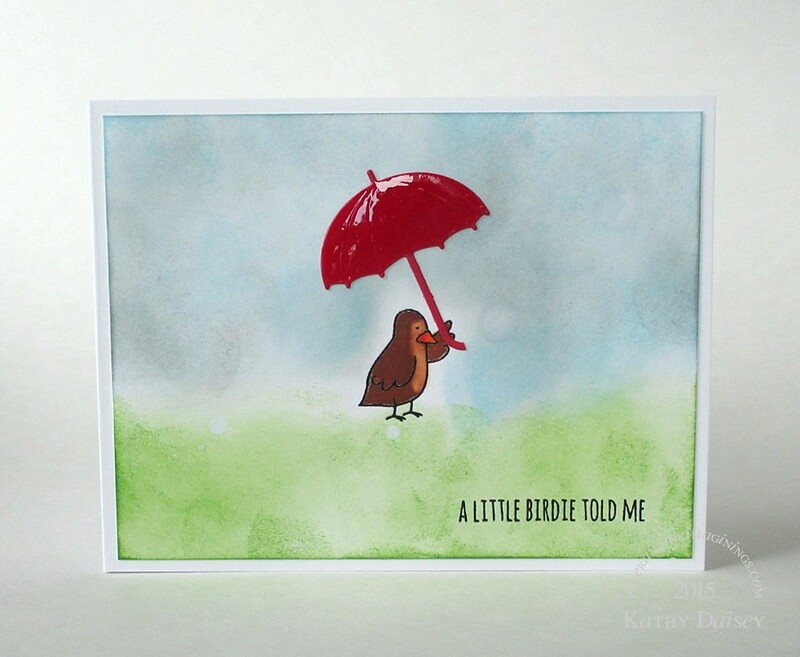 I decided to use the bird from the Essentials by Ellen Wish Big set, and an Impression Obsession umbrella die. I wanted the background to be a bit abstract, so I didn’t blend the Distress Inks perfectly, and I flicked on some water droplets and sprayed a little more water onto it. The bird was colored with ZIG Clean Color brush markers, and I added a little bit of water and dabbed some color away from the bird’s breast and face. Finally, I trimmed a bit of the curve off the umbrella handle, and added a coat of Glossy Accents to the canopy. My plan is to use this for a get well card – kind of an “under the weather” thing. I was thinking about adding some Swarovski crystals as rain drops, but that would preclude me from using this for a male. I can add them later if I need the card for a female. Supplies: Stamps – Essentials by Ellen, paper – Neenah Classic Crest Solar White, Stampin’ Up! Real Red, inks – Tim Holtz/Ranger Distress Inks Hickory Smoke, Mowed Lawn, Tumbled Glass, VersaFine Onyx Black, ZIG Clean Color 060 Brown, 070 Orange, die – Impression Obsession, embossing powder – Filigree Fine Art Powder clear. Categories: card, caring, get well | Tags: card, Essentials by Ellen, Essentials by Ellen Challenge, Impression Obsession, Neenah, Ranger, Stampin' Up!, Tim Holtz | Permalink. Oh my gosh Kathy this is too, too cute. Love the glossy accents on the umbrella. I love the glimpse into your creative process.